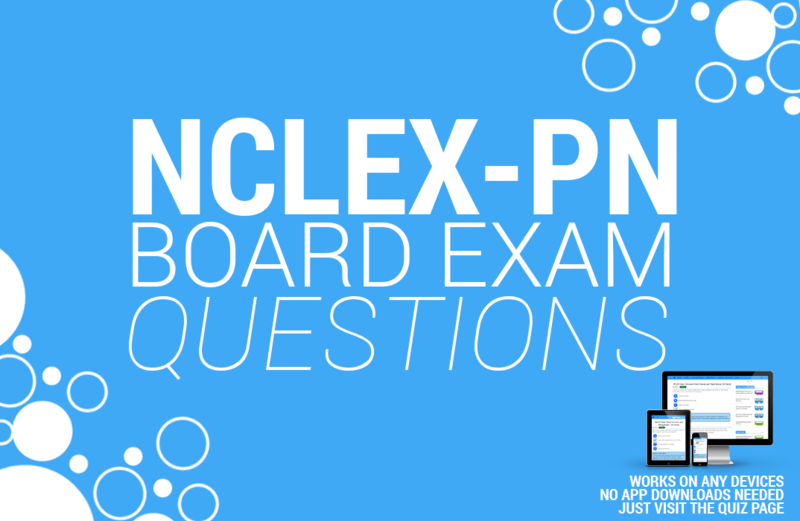 Nurses who will be taking the NCLEX Practical Nursing (NCLEX-PN) exam should take our practice quizzes. These free questions will help you enhance your critical thinking skills and make you more prepared for the actual exam. Be sure to read the answers and rationale. If you need clarifications or found any typos, direct them to the comments section for each exam. For each quiz, you’ll see the three (3) mode Text, Practice and Exam. In Text Mode: All questions and answers are given on a single page for reading and answering at your own pace. Be sure to grab your pen and paper to write down your answers! You can also copy the exam and make a print out or a PDF. In Practice Mode: This is an interactive version of the Text Mode. All questions are given in a single page and correct answers, rationales or explanations (if any) are immediately shown after you have selected an answer. No time limit for this exam. Exam Mode is similar with Practice Mode but the questions are shown in random. Answers and rationales (if any) will only be given after you have finished the quiz. You are also timed on this mode, a total of 1 minute per question.